Thermal conductivity, is a physical property, which measures the capacity for heat conduction, or the capacity of a substance of transfering the kinetic movement of its molecules to its own adjacent molecules or to other substances with which it is in contact. Depending on the composition of the atoms of a material, the heat may move very slowly, or very quickly. This dependence is quantified by the coefficient of thermal conductivity. For example, thermal conductivity is higher in metals and is lower in gases. 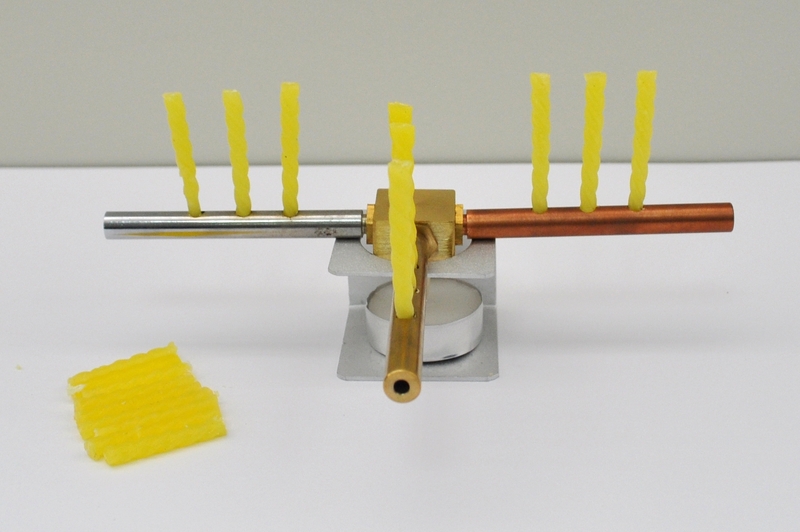 In this kit, a qualitative and a quantitative study of the thermal conductivity of different solids such as copper, brass and steel, is conducted. 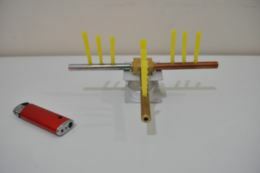 Thermal conductor (with three metal bars: copper, brass and steel), Candle, Eighteen small candles for qualitative measurements, Candle holder.